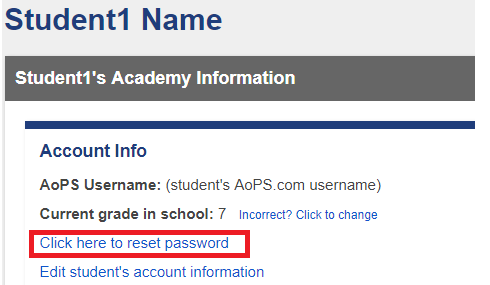 To reset your child’s Student Account password, please sign in to the AoPS Academy site with your Parent Account. To do so, please click the "Sign In" link at the top-right of any AoPS Academy page. Your Parent Account "Username" is the email address you provided when creating an account. If you have forgotten your password, please click the "Forgot your password or username" link. Once you are signed in, please move your mouse over the "My Academy" heading at the top of any AoPS Academy page, and then click the name of your student. 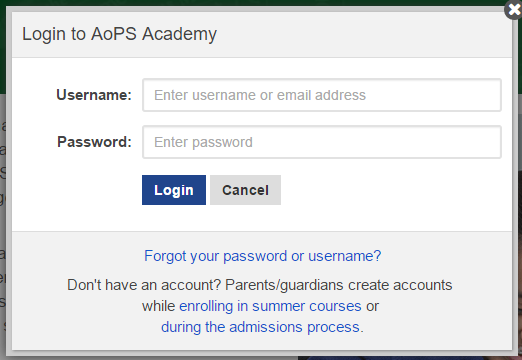 If you have associated an AoPS username with your student's AoPS Academy account, you should find a "Click here to reset password." link. After clicking that link, you will see a new window that allows you to enter a new password for your student. Select "Cancel" if you decide you would not like to reset your student's password. After typing in a new password and selecting the OK button, you should see a confirmation that your student's password has changed. Your student should immediately be able to sign in with their username and the new password you created.